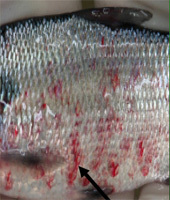 Viral Hemorrhagic Septicemia (VHS) is a viral pathogen that causes fish to bleed internally. Discovered in Lake Huron in 2005, the disease spread into Lake Erie and recently was discovered in Budd Lake, an inland lake in Clare County (in the northern part of the Lower Peninsula). VHS is a disease that has the potential to devastate entire fish populations. There is no known cure or vaccination. VHS is not a native disease and like so many other aquatic invaders, is suspected to have been delivered to our waters in the ballast of ocean-going vessels. The virus has been detected in 32 fish species in the Great Lakes region including walleye, muskellunge, whitefish, freshwater drum, and gizzard shad. Two separate discoveries announced in 2010 documented the arrival of viral hemorrhagic septicemia virus (VHSV) in Lake Superior. Infected fish shed the virus in their urine and reproductive fluids. The virus can survive in water for at least 14 days. Virus particles in the water infect gill tissue first, and then move to the internal organs and the blood vessels. The blood vessels become weak, causing hemorrhages in the internal organs, muscle and skin. Fish can also be infected when they eat an infected fish. VHS can cause large fish kills, reducing important recreational opportunities, subsistence and commercial fish stocks, alter food webs and age structures of fish populations, and create unpleasant conditions such as large piles of dead fish along the shoreline. Report any suspected findings of VHS and the location in which the fish was caught to Tip of the Mitt Watershed Council by calling (231) 347-1181 or by e-mail at info@watershedcouncil.org .